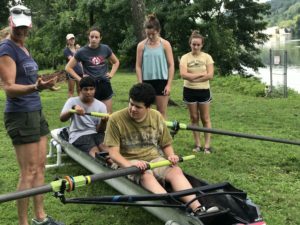 The Special Needs Learn To Row Program was an opportunity for special needs youth to be introduced to the unique sport of rowing. 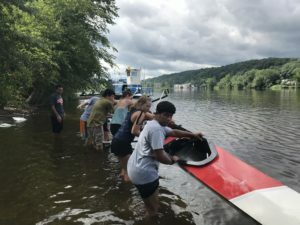 In early August, six students from New Hope Solebury High School were brought down to the Delaware River to learn more about our sport. 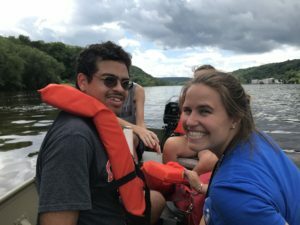 Six experienced youth, a coach, and two masters from Swan Creek along with three teachers fromNew Hope Solebury gathered to teach them something that they normally wouldn’t get to experience. 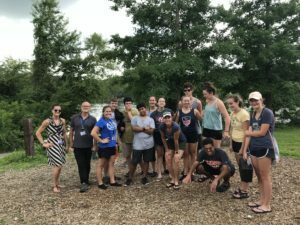 In the first session the students were taught the basics about the boats, including how to get into the boat and how to handle the oar using a trainer on land. They then went out on launches to see the Swan Creek youth put what they learned into action. In the second session they built on what they learned before adding in helping carry the boat down to the water and practice the skills that they were taught before by climbing into an actual boat on the water. Their enthusiasm and willingness to try something new, which was an enormous step in their otherwise routine-based lives, was infectious. 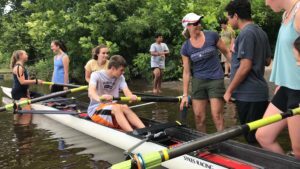 The smiles on the students’ faces while they were taught how to row was something no one would forget. Special thanks to Olivia Ondis for pulling this program together. And thanks to Trish Riley for the photos. The full collection is here.